The Galaxy Comet is Rosalina's kart that appears in Mario Kart Arcade GP DX. It has a similar design to that of a comet, like the Shooting Star kart from Mario Kart DS and the bike of the same name in Mario Kart Wii. It has a yellow body with blue sides and wheels, like Rosalina and Luma's afflicted colors. 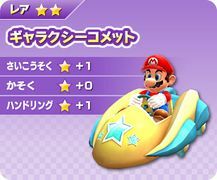 Alternate colors for the kart are pink with turquoise stars and dark blue and gray with yellow stars. It grants the user a speed and handling bonus, but does not affect acceleration. This page was last edited on March 6, 2018, at 18:49.